When your baby stares at you or anyone around you, what do they see? Two studies show that babies and toddlers prefer staring at pretty faces more, and suggest that children trust pretty people more. Do you ever wonder why sometimes, your baby prefers to stare at some people and not others? What does it mean when a baby stares at you? 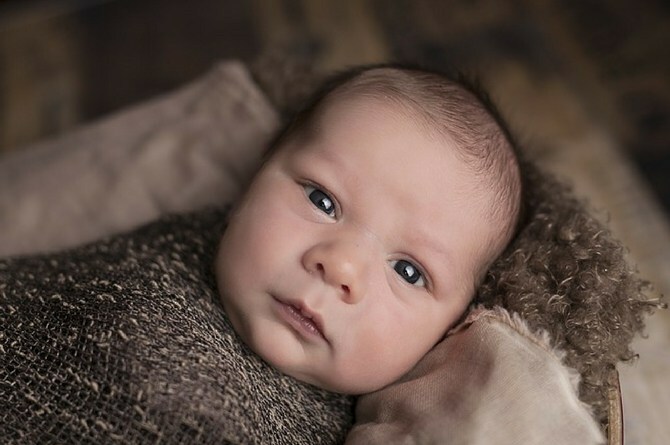 A 2004 study in the UK has observed that newborn babies prefer to look at attractive faces, which suggested that babies do not learn face recognition, but rather come with them from birth. In the study, researchers Alan Slater and his colleagues at the University of Exeter showed paired images of faces to babies. These babies are as young as one-day old and researchers found that they spent more time fixated on the more “attractive” face. A baby stares at attractive faces! Developmental psychologists have observed for many years that babies prefer certain objects. These can be high contrast images and curvy, biological shapes. However, they did not know why babies prefer them, and where these preferences come from. The research suggested that babies are not exactly blank slates and instead come into the world with a fairly well-developed perception systems. So why do babies look at pretty people? In the study, the researchers took pictures of a variety of female faces. They then asked adults subjects to rate them for attractiveness. These subjects scored each face on a scale from 1 to 5. Next, the researchers looked for pairs of photographs that were similar to the chosen photographs in all respects like brightness and contrast, but are at the opposite end of the “attractiveness” scale. Afterwards, they presented these paired photographs to newborn infants, ranging from one to seven days old. The study noted that all of the babies in the study were still in the hospital after birth. One researcher held each infant upright about 30 centimeters away from the two photos, while another stood out of view and noted where the babies eyes were directed. According to Slater, almost all of the babies spent more time looking at the pictures that the adult subjects rated more attractive. He presented his results at the British Association for the Advancement of Science Festival of Science in Exeter. Slater suggested that the reason why babies prefer “attractive” people is because they pretty much exhibit the prototype of a perfect human face. Of course, a baby’s notion of attractive maybe different from a more mature human’s notion of attractiveness. But from their perspective, these beautiful faces may represent the stereotypical human face which they have evolved to recognize, Slater said. In another study in 2013, researchers tested 32 four and five-year-olds by showing them 12 photos of women aged 18 to 29 years old. They found that these toddlers tended to trust answers from picture of attractive women. As with the previous study, the photos had been selected from a pool of 56 original images. This was done by a panel of university students who rated their attractiveness. From this pool, only the most unattractive and unattractive were presented to the chidlren. Harvard University’s lead researcher Dr Igor Bascandziev said: ‘When learning about the world, children rely heavily on information provided to them by other people. Previous studies have shown children can be influenced by a range of factors. This can be whether the adult was correct in the past or if they are familiar to them. “Our study wanted to examine whether children would trust an attractive stranger over an unattractive stranger,” Bascandziev said. As the baby stares: Is there danger in this? In the study, researchers showed the children pictures of six objects and asked to name them. Whether they guessed it correctly or not, the researchers then suggested they seek the help of one of two people. It’s at this point that the researchers showed the kids the two photos, one attractive and one attractive. The researchers then asked them who knew the answer. The results of the study was published in the British Journal of Developmental Psychology. It showed that more children initially selected the attractive face, especially women. Both boys and girls are more likely to trust or believe an attractive-looking woman compared to an unattractive one. “It would be interesting to see future research explore whether children would continue favouring the more attractive face even when they have evidence that the more attractive face is unreliable and the less attractive informant is a reliable informant,” Bascandziev said. It’s worth noting however that “attractiveness” here is subjective. There’s no clear and objective metric for attractiveness. This is especially true when one takes into account the face shape and skin type of people according to race. Another thing worth noting is that both studies use an adult perspective to determine which ones are attractive or not. Therefore this puts a bit of a bias on the results. What makes people “attractive”? Is pretty good and ugly bad? But the next time your baby stares at you, take comfort. Aside from being your child’s parents, maybe your baby thinks you’re just so gosh darn beautiful! You can also read: Grandparent child care can be harmful to kids when unchecked. Can't seem to get your baby to stay asleep? Try this genius mum hack!